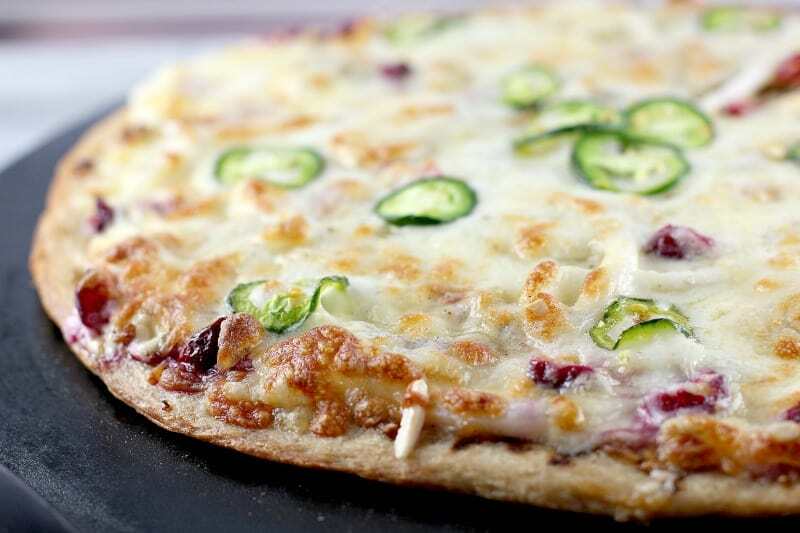 A little tart and a little spice highlight this super cheesy, super delicious, fun gourmet pizza. 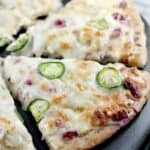 Two cheeses, tart cranberries, spicy sausage and jalapeno, and a dreamy Dijon cream sauce to die for, make this easy Cranberry Sausage Pizza recipe for your next pizza night. I received a complementary bag of Cape Cod Select Cranberries as incentive to enter a recipe contest. I have received no other compensation. 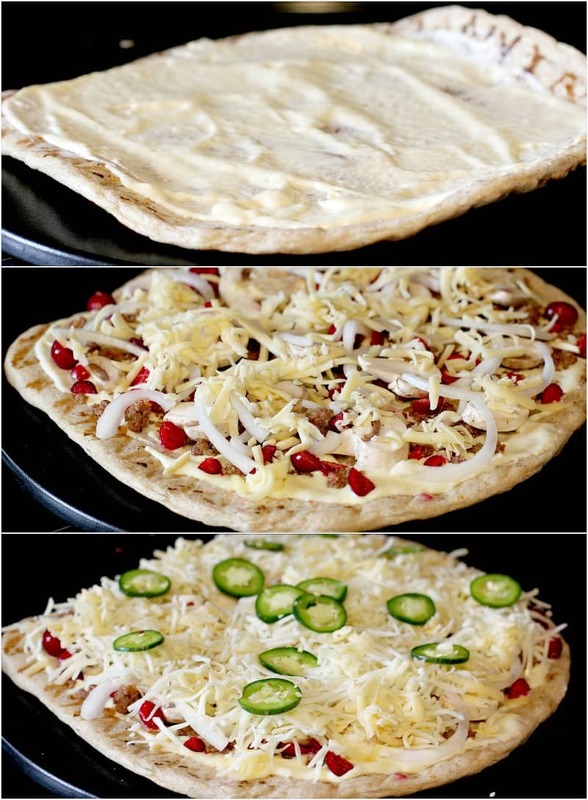 Fun gourmet pizza recipes rock. This is a lot easier to make that it looks. Sausage and cranberries together. Are delicious. Life is too short not to try tasty, kinda-out-there recipes like this! So there we have it. Add these ingredients to your grocery list pronts. I don’t just love cranberries, I loooove cranberries. I am a Boston girl, they are my birthright. And I LOVE using cranberries in unexpected recipes like my Cranberry Chorizo Macaroni and Cheese and Cranberries ‘N Cream Bacon Bites. They are more tart than sweet so they actually work so beautifully with heavier ingredients …in this case, sausage, cream, and cheese. Tons of cheese. So, cranberries are the perfect complement here to add that extray “OoOhhh” in the midst of these other, rich ingredients. I used Cape Cod Select Premium Cranberries, and if you have not heard of Cape Cod Cranberries yet, this is a women-owned, small family business with an 800 acre farm (solar powered facilities too! ), and they’ve been growing cranberries for 75 years. And they sent me a bunch so I have been cooking up a cranberry storm this month. For the base, I used a freezer thin crust that I have used many times before. Then I made my creamy Dijon sauce similar to when I made Chicken Cordon Bleu Pizza. Then we just assemble our beautiful pizza and lett’r cook in a hot oven, and ENJOY. The flavor combo here is SOOO good. WARNING: this is spicy. SO, if you don’t want that, just substitute regular sausage. It’s all good. The spice level was fine for us, and with the fresh bell pepper and onion and sweet cranberries, it all balanced out deliciously. So that’s it folks! 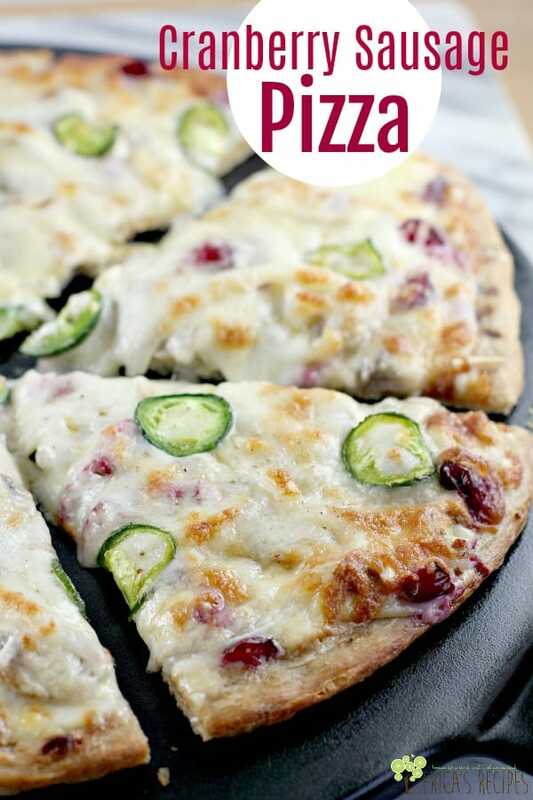 A fun gourmet pizza with a fantastic flavor combination. 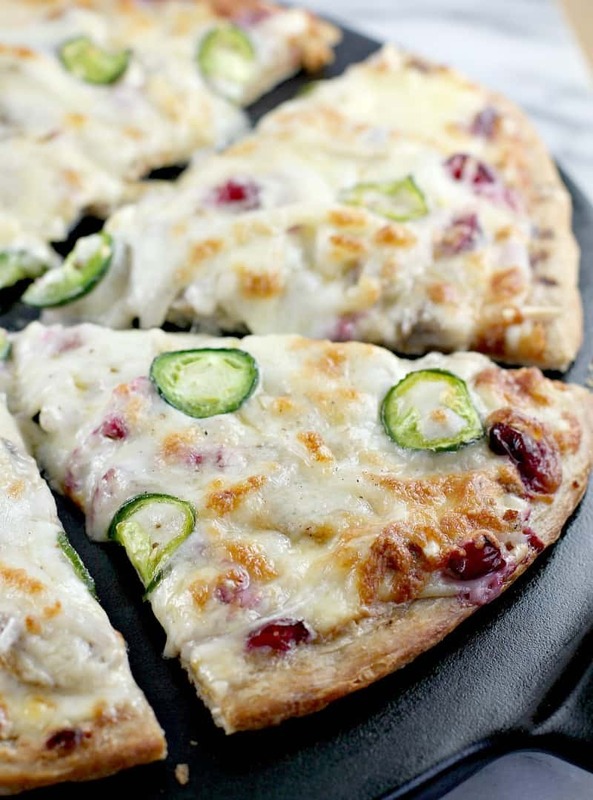 Cranberry Sausage Pizza is easy to make and even better to eat! 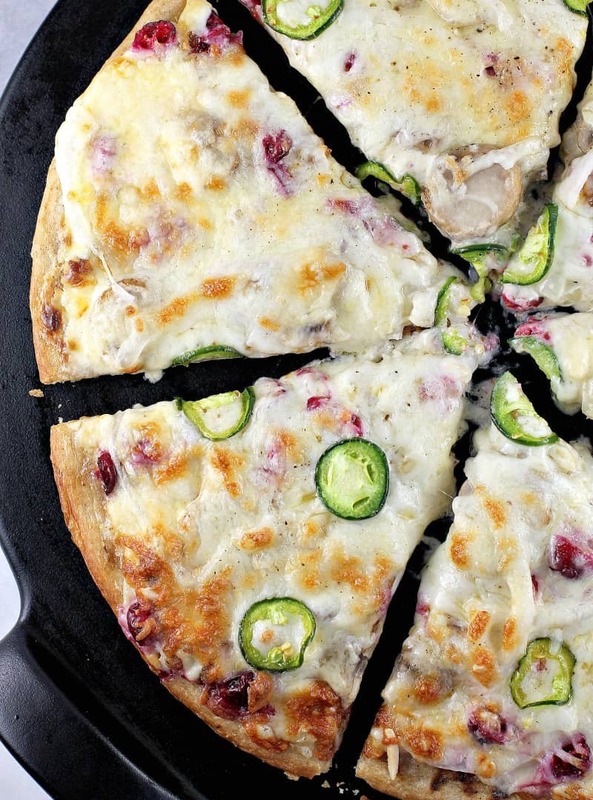 A little tart and a little spice highlight this super cheesy, super delicious, gourmet pizza. In a medium, nonstick skillet, heat the cream. Once at a simmer, reduce heat and cook gently, stirring regularly, until reduced by half. Add the Dijon and salt and set aside. Heat the oven to 450F with the pizza stone in the oven. Remove the preheated stone from the oven. Assemble the pizza: crust, Dijon Cream Sauce, sausage, onion, mushrooms, almonds, cranberries, cheeses, jalapeno, and pepper. Bake at 450F for 10 minutes. Reduced heat to 400F and bake until all bubbly and golden. Yields: 3 servings. This pizza, with the hot sausage and a fresh jalapeno from my garden, was spicy. But it was good spicy, not bad spicy. So, if you like some spice, make the recipe as written. 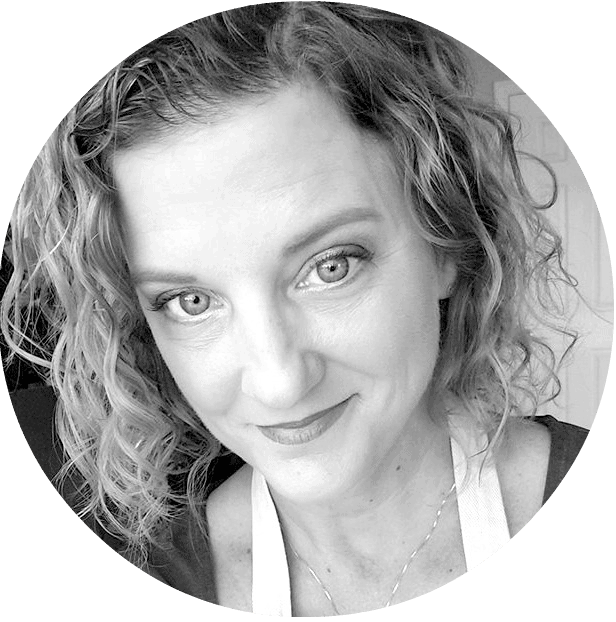 If you are either weak-kneed and spice-averse or if you have kids to feed, use regular sausage. 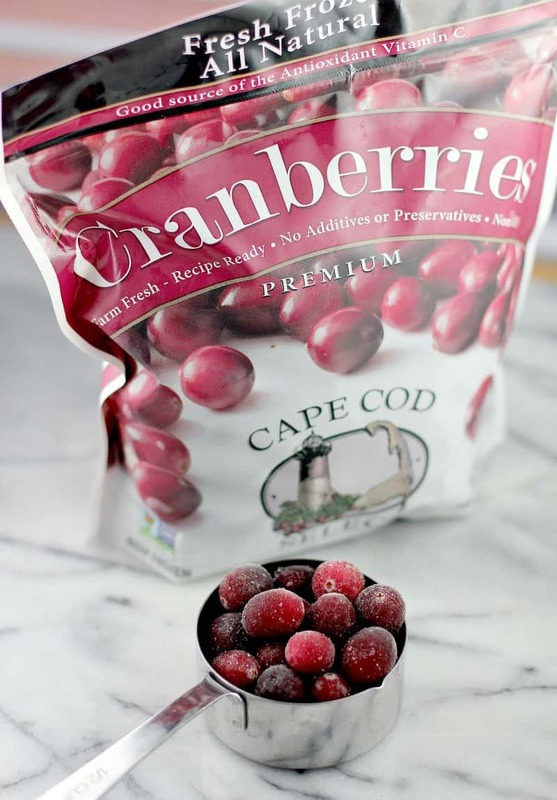 To find where you can buy Cape Cod Select frozen cranberries, visit HERE. Or order online HERE.